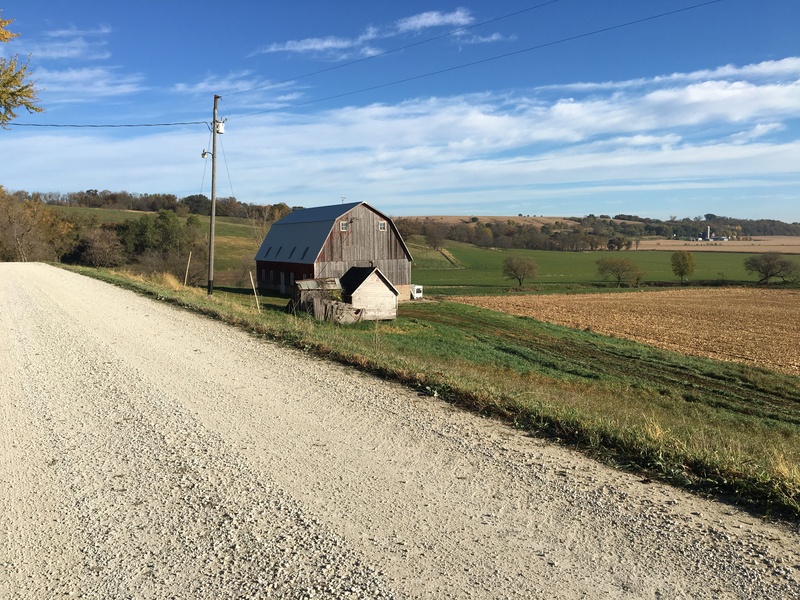 This is the last post in a series of 3 talking about the beautiful and insane Alexander 380 gravel course, and how a group of us rode it in three days this fall. Missed parts 1 and 2? Go here and here. After not having slept much after our first day of riding, I decided to break out the big guns on night #2 and take something to help me sleep. I knew it would make me a little groggy in the morning but I decided to gamble and capitalize on resting instead. We woke up to a crisp, cool morning, ate a paltry breakfast at the hotel, and got rolling. We were anxious to get started on our last day of biking and get back to our vehicles at a quasi-reasonable time. One of the other cyclists, the one we hadn’t seen since mile 70, had rolled out before us that morning and we could see his tracks in the damp gravel. It was motivating to think that maybe we were reeling him in slowly — it gave me a reason to push when I didn’t want to anymore. By now my saddle sores had settled in and/or I had figured out how to mitigate them, my legs were dead but based on the day before I knew I could bike on them ad infinitum, and I had done an adequate job fueling and hydrating to avoid bonking. All in all I was in damn good shape for logging about 250 miles over the last 2 days. Mentally, this day was arguably the easiest. The planned route was the most direct of the 3 days, so 90% of the time we were moving towards our final destination. There was something SO SATISFYING knowing that each pedal stroke took me closer to my goal. I had biked this whole section before, the only section of our Fallexander route I had successfully finished, and that gave me some confidence to carry on. I knew one of my favorite gas station restaurants awaited me in Lansing, and at the end of the day I could crash in my own familiar bed. The allure of finishing the route and accomplishing this major goal was high. Most of my journey left no time for cameras — stopping meant ceasing forward momentum, and that was usually unacceptable. Once again I was riding off the back while Leah and Jere surged ahead a little. It wasn’t a bad thing this day though — I was at peace pedaling along and taking in the familiar sights. The bike tire tracks of the early cyclist mysteriously vanished around mile 40 and we wondered what had happened (we later found out that rider decided to head into the town of Preston, MN to grab a bite to eat). I reveled in the fast descents, whooping with glee as I pushed the pace. Sometimes I can be a skittish descender but not this morning. After putting that many miles on my trusty cross bike I felt like we were one stable unit. We made it to Harmony, MN and its Kwik Trip around mile 65. I struggled with the hustle and bustle of the gas station, finding the sounds and smells of wafting cigarette smoke completely overwhelming. I was anxious to get back to pedaling through the farm fields but simultaneously a little disoriented and having trouble fueling and getting the necessary rest stop tasks done (reloading water bottles and Camelbak, using the facilities, reapplying copious amounts of chamois cream, and trying to anticipate what foods would sound palatable hours from now). We didn’t have another stopping point until the end of the journey so I knew it was absolutely critical to make the right decisions with nutrition and fluids. By this point my stomach was revolting but eating was a necessity, and I choked down some of my favorite gas station delicacies. The three of us rolled out of Harmony and once again my Garmin stopped giving me cues. I decided to hell with it, I would reset the device and restart the route in hopes it would give me cues. I had given my cue sheets to Jere since he had misplaced his, plus I knew my tired brain wasn’t going to be up to the task of figuring out cue sheets even if I did steal them back. (That’s another area I need more practice with – I can read cue sheets fine but tend to get distracted or zone out, missing turns and having to reroute more than I’d like. Practice makes perfect, so maybe that’ll be my next gravel project.) My Garmin beeped back to life and began spitting out turn directions for me. Hallelujah! The next many miles took us almost directly east with a very strong crosswind, and most of the crops had been harvested so we had minimal cover. When I would fatigue I would remind myself that I am a crosswind cycling machine. I’m 5’1″ , quite heavy and dense for my height with most of my weight being in my quads and glutes, with a low profile to avoid catching a lot of the wind. I would put my head down and hammer away, catching Leah and Jere with much less effort than the other days. This was finally a section of the course that catered to my skills and it was refreshing! It’s hard to describe the feelings I had when I biked past familiar places from my first Alexander attempt. I remember the cold, bordering on icy, rain. I remember getting pelted with hail, and remember there being so much grit and water flying up from the road that descending was terrifying as I couldn’t see more than a few feet ahead of my front wheel. The gravel roads had streams and small ravines running down them as the downpours carved out the fastest way down the hill they could find. I trudged up almost every hill, my shoes making sucking sounds with every step. I was soaked to the bone and wanted to quit, but knew that stopping meant certain calamity. Movement equaled warmth. Somehow, I remembered all this with a fondness — I think it was because I remembered how tough I had been conquering many of my cycling fears that day. We rolled into Eitzen and I was desperate for more sugar that didn’t involve chewing. We stopped under an awning, the same awning we had passed other cyclists during the first Alexander and I had yelled “Welcome to hell!’ through the cold rain despite never having met them before. They still remind me of that outburst! By this point of the journey, chewing was too difficult and I wanted to slurp my calories. I could tell I needed more electrolytes as the dizziness was back but it wasn’t too terrible. I kept reminding myself that I was doing damn well considering how much I had biked the two days prior. I had never done two hard back to back days like this, let alone three. I bummed some small bills off of Leah and Jere and bought a Pepsi, pouring it into my water bottle. I knew it was just going to fizz and get sticky syrupy goo all over the downtube and bottom bracket cable routing, but oh well. I needed it! The sun was setting and I KNEW I was going to make it to the finish! The question was, how long would it take me? My speed slowed down dramatically but I really didn’t care. I told Leah and Jere to go on without me as they were feeling good. I told them to get to their car, load their bikes onto the vehicle, and if I didn’t show up within 30 minutes to drive the course backwards. As darkness settled I felt a little spooked and a little dizzy still – I just couldn’t shake it. I descended slow and rolled cautiously. It would be a damn shame to crash and not make it to the end of this thing just because I pushed the pace faster than I was capable of. I knew to watch for a sharp left-hand turn towards the end of the route, a turn that takes you right back up a ridge you’ve just descended. My tired legs were fading fast and I found myself counting 5 pedal strokes at a time, then 4, then 2, then 1. “One, one, one …” until I just couldn’t get another one out. I walked up the hill but it was a much more pleasant experience than the spring. No rain, no cold, no soul sucking muck to trudge through. Oh, it’s the little things ..! I biked the final few miles along the ridge and then began the last descent. I descended at a glacial pace but again, I didn’t care. Leah and Jere were no where in sight, but that was expected. I had slowed down a lot but all that mattered was forward progress. I rolled into my favorite gas station, my salvation, and ordered a pizza, breadsticks, and an entire quart of chocolate milk. I began gulping down the milk and dunking the breadsticks in glorious, fluorescent gas station nacho cheese dip. Leah and Jere soon joined me and began to scarf down food as well. I was mostly in shock that I had finished this thing — the number of miles is still surreal. I drove home without incident and eventually crashed in my own comfortable bed. I took the next day off of work and any time I sat down and stopped moving I would fall asleep whether I really wanted to or not. I had some odd swelling in my face and limbs, but in general my body felt pretty damn good. I was exhausted, satisfied, and worn out in the best way possible.